Don't do this mod -- buy a Raptor petcock (much easier to do) and you can take your tank off without all the hassles that the stock petcock causes. This post is the prelude to the how-to. 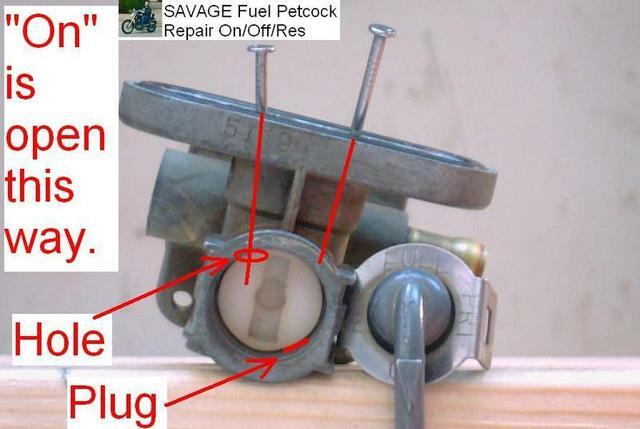 Some of you have asked why and how I converted the stock Savage vacuum petc0ck to manual dirt-bike style ON/OFF/RES. I did it 'cause I had fuel leaking thru the vacuum diaphragm into the vac port on the carb, causing my crankcase to fill up with gasoline regardless of petc0ck position. Further, the bike only ran right in "PRI". Finally, I am too cheap to spend the money on a new petc0ck that I believe will fail in the same way my old one did. I'm used to manual valves anyway, having grown up on 3-wheelers and dirt bikes. This conversion is a modification to the bike. Some pretty folks will tell you this is a hack job, you ruined the whole bike, and the sky is falling. 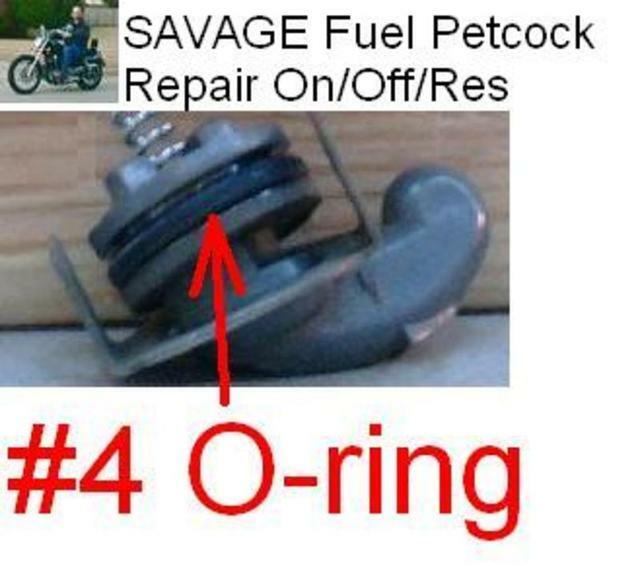 A dealership mechanic who evaluates your bike will blame any problems on this contrivance and try to sell you a new petc0ck along with God knows what else at a high price. It will probably void a warranty, though if the bike was under warranty you would not be doing this anyway you'd take it back to the dealer and make him fix it. 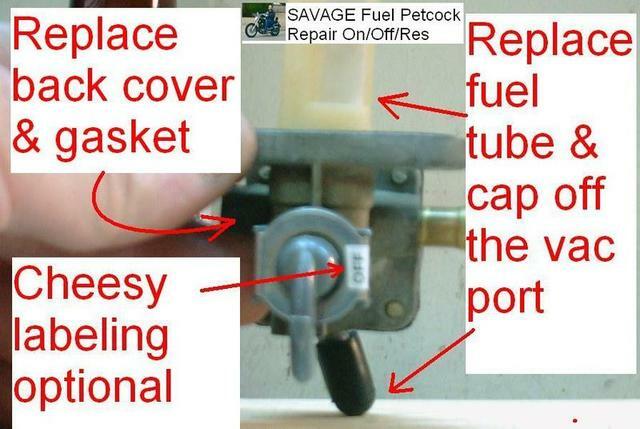 GASOLINE is flammable and irritating to the skin. Even if it does not catch fire, it will get under your rings and burn your skin like crazy. Take off your rings. 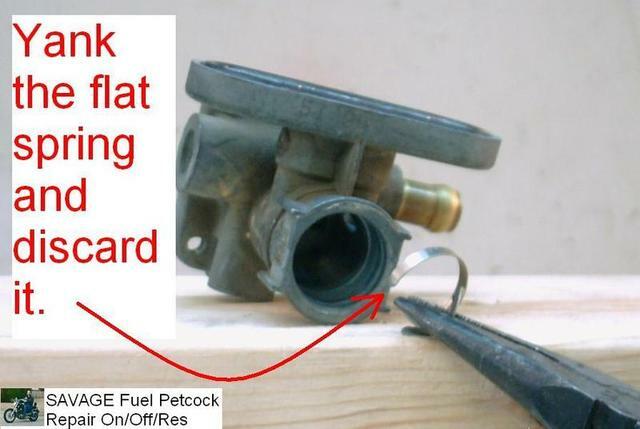 Finally, remember to turn the petc0ck off just like on your old dirt bike, Harley, ATV, etc. when you're finished riding so IF THE FLOAT NEEDLE MALFUNCTIONS you won't fill up the crankcase with fuel. 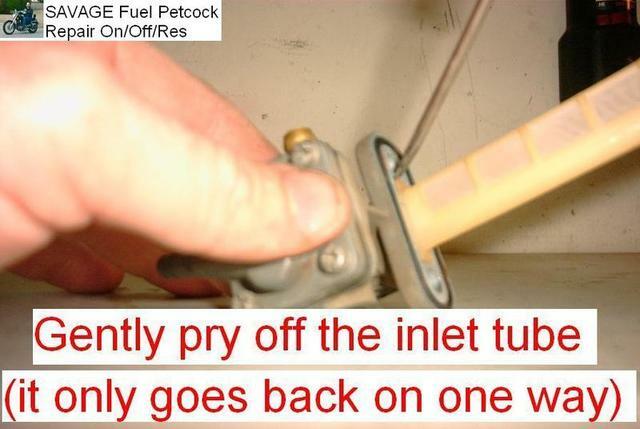 Drain the tank and remove the petc0ck by yanking the 2 bolts that hold it to the tank. On my bike, I could do this with the tank on, but you might have to remove your tank to do it (see tank removal thread: http://suzukisavage.com/cgi-bin/YaBB.pl?board=tech;action=display;num=1100708616). 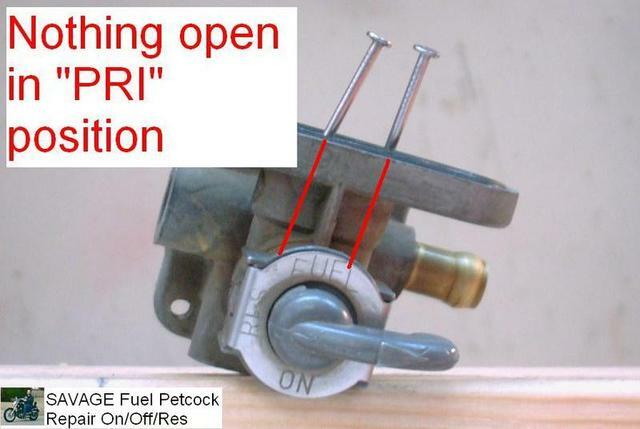 We are going to seal off the hole that corresponds to "PRI", making it "OFF" for fuel flow. 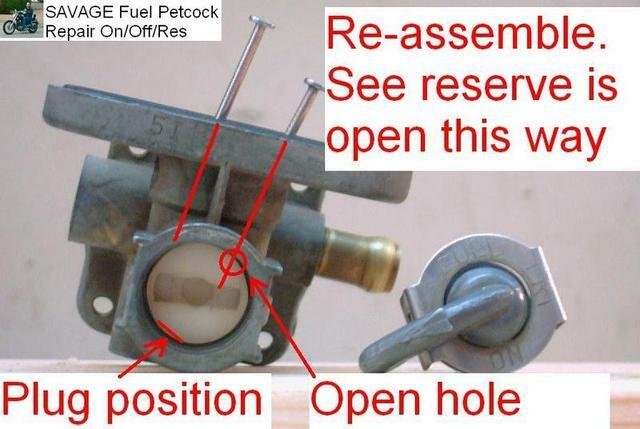 Then we will delete the vac diaghragm so fuel will actually flow in "ON" and "RES". CAREFUL, there's a little coil spring on the backside of the lever that will induce Turrets syndrome if lost. 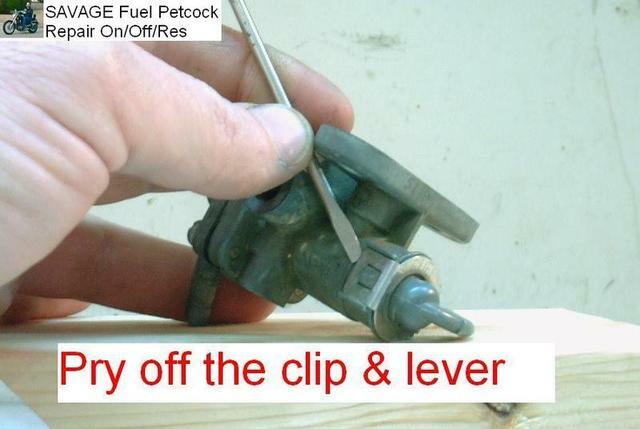 Grind or sand the plug off flush or just below flush. If you use a Dremel like I did, GO SLOW and grind in short bursts followed by plenty cool down. 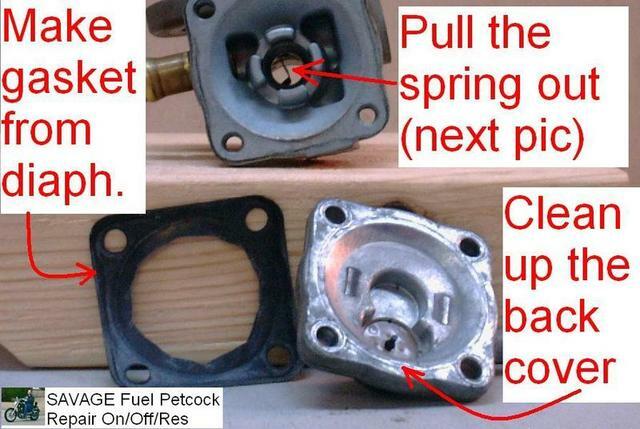 If you get it too hot, the plug will move and you'll have to start over and re-fit the plug. Once that's done, you have sealed off the "PRI" hole, making it "OFF". 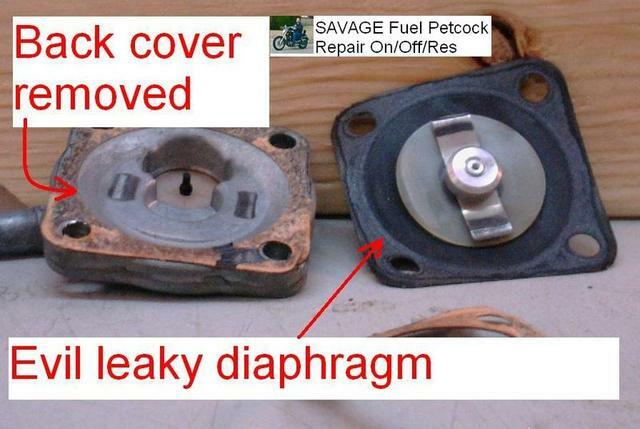 Set it aside for now and we'll open up the back to defeat the nasty vacuum diaphragm (next post). We have now defeated the leaky vacuum diaphragm and we have a twisted sense of satisfaction cutting it up. Now to re-assemble (next post). 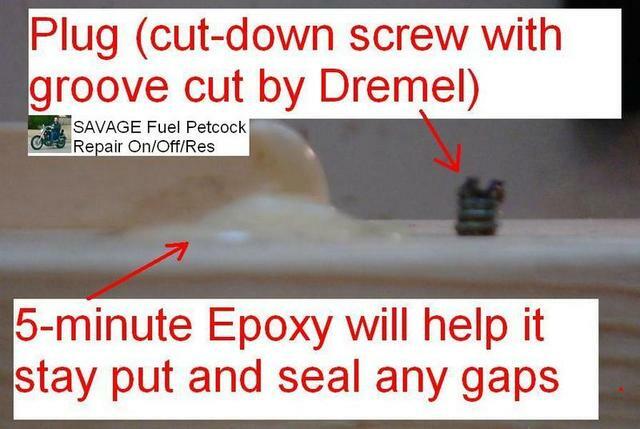 With the "PRI" hole plugged in the white plastic valve, we now line up the plastic valve so the remaining bigger hole lines up with the fuel inlets. 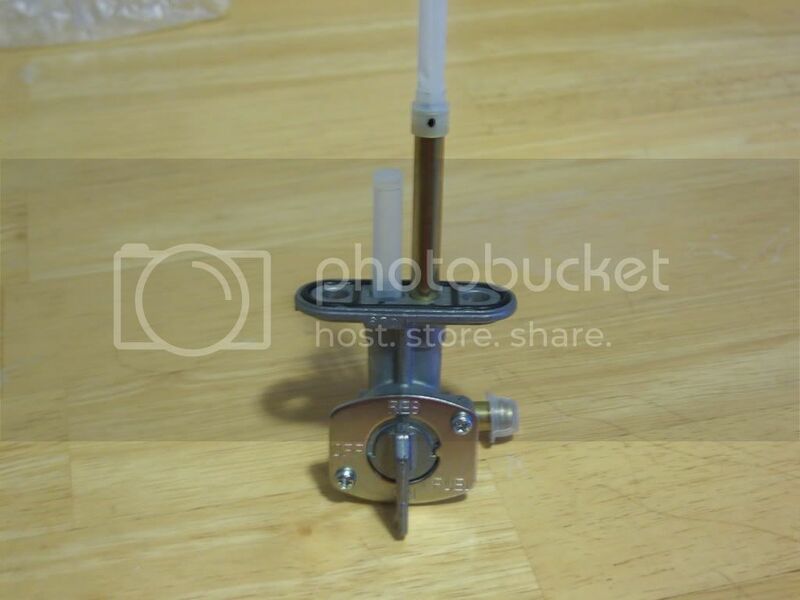 In these pics, I turned the selector lever to match the plastic valve position. and finally installed the lever by the third photo. I used nails and red lines to show where the hole lines up, as I could not photo it adequately. You, however, can see how the hole lines up by looking down the top of the petc0ck with good lighting. You don't need no stinking nails. You are now DONE and ready to put your manual work inducing misery whip back on the bike, fill the tank, and watch for leaks. You may get a leak around the lever, since we disturbed that O-ring. If you do, replace the O-ring. Go to the hardware store and get a #4 O-ring out of the fauct parts section (around plumbing and the new faucets). At least here in Arlington at Lowe's it was marked as a #4, but take the old one with you to make sure. Things get messed up in those big stores and most of the employees are too overworked to care about fixing it. The #4 is a perfect fit and stopped my leak. 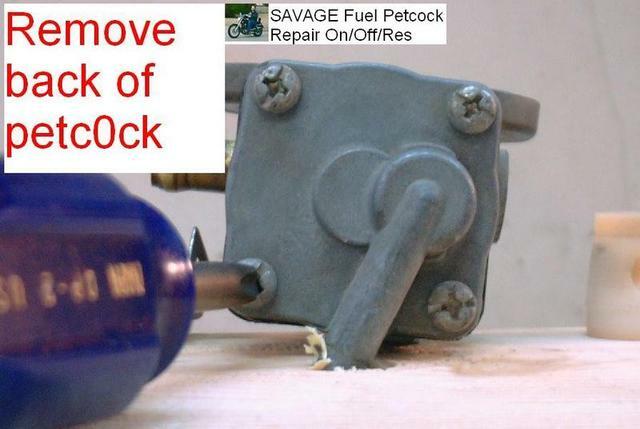 RTV Silicone can help seal the petc0ck body to the tank if need be, further enraging the pretty boys who called you a hack for doing this conversion. $20.89 from bike bandit plus shipping. it's a direct bolt on. not as pretty as the original part. has on, off and reserve. 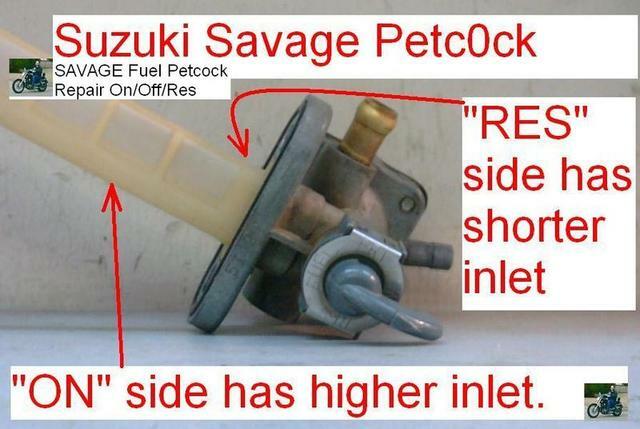 the nice thing is this petcock doesn't go under the tank towards center of the bike nearly as much as OEM so taking the tank off and on won't be such a tight fit. At Ron Ayers Motorsports, it cost less money. $15.61 isn't that bad a price. Ron will charge you $9.00 flat rate for shipping. Now, Franch gets full credit for his marvelous find. But please, somebody who does this who owns a camera please fill in all the blanks by posting appropriate additional information below. Just did the conversion on the "Leaky Petcock" I got from Verslagen. Notes: I used a nylon 10-24 screw I bought from the hardware store. Much cheaper, 24 cents (US). And , it is much much much easier to work with too. 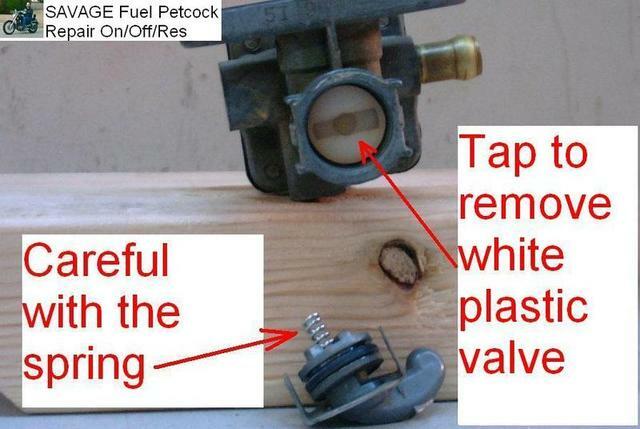 I suggest using a tap to make the threads in the smaller PRI hole in the valve body. I just pushed in a metal 10-24 bolt to make the threads and had a slight bump form that I had to file down. I used some Permetex Ultra Copper to do the seal. 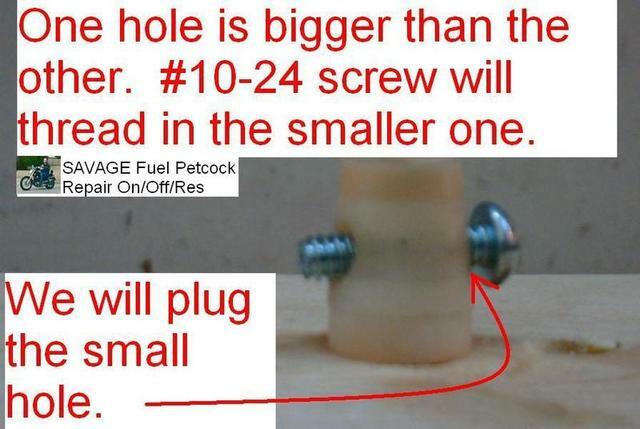 (I had it from the head plug change) See pict. Second, I made an aluminum plate on the back for thinner profile. No chance for the old port to leak and there is no mistaking it's been converted. Third, I have a letter punch set I got from Harbor Freight, (1/8 " letters). I lightly filed the PRI and punched OFF in it's place. I am not happy with results. I used a slightly camphered piece of metal backing to punch the letters so the center F shifted. Raptor petcocks have screens on both tubes (as are clearly shown when looking at the correct pictures as the round white fine mesh tubular screens).